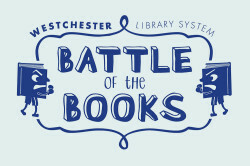 Battle of the Books is a book-based trivia tournament for Westchester youth in grades 4-10. The teams will compete by answering trivia questions based on the 5 books for their grade bracket (on this page) in October. Teams will meet many times between now and the Battle in October to practice for the big day! 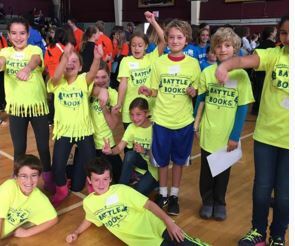 WHO CAN BE ON THE BATTLE OF THE BOOKS TEAM? have 3-5 participants per round. WHY PARTICIPATE IN BATTLE OF THE BOOKS? You will be part of a team that loves to read and loves trivia questions and it is lots of FUN! Bedford Free Library would love to have a team! Second Place Winners of this year’s Battle of the Books for 2016 for Grades 4-6. The team was led by Maureen McManus, YA librarian, and Danielle Blachar. Winners of this year’s Battle of the Books for 2015 for Grades 4-6. The team was led by Maureen McManus, YA librarian, and Nellie Mitchell.